When I kept moving further towards my working tower, I had found a building next to mine had caught an extensive fire and it was the abysmal thing happening over in my workplace. People were struggling to come out of the tower. Rescue operations had been at its peak but it seemed there would be tons of people inside the building who were unable to get out of this morass.That was the reason for all those parked fire extinguishing vans and police patrols on my way. It is actually a kind of tall tower and that day seemed some taliban attack had been done on it just like a "twin tower" trend. But after a brief inquiry from those who were running thoughtlessly, I found that due to some short circuit issue in the second floor of that multi-storied building, there occurred a firing on the network which had kindled the fire throughout the building. Those who were stuck inside were shouting in fear and the smoke had been covering the entire workplace and it was getting harder for the extinguishers to proceed with their safeguarding attempts. In fact, their preliminary measures had kindled the fire to a greater extent and no one inside the tower were able to come or jump out !! Emergency exits were completely covered by smoke. People were clueless to move. Situation was getting more than being bad. And, my instinct kicked my brain to the exclusive need for the use of my second mantra. Yep. I did it in no time. Closed my eyes. Brought the right fist to my heart in thinking of safeguarding all those suffering colleagues. When I had opened my eyes, entire chennai city was visible to me. Yep I had suddenly grown up about 150+ feet. I was almost resembling a huge HULK physique but three times bigger than that giant man. This time I was not in green but in blue color. Everyone who witnessed were running out from me and even the extinguishing people were feared down on seeing me growing extremely big suddenly and finally everyone had left the place of fire but caught with some fear on me. I hardly had time to let them know that this avatar of mine was only for their goodness. Then, I was cornered to be the only hope to help out those people caught inside the burning tower. When I was thinking what to do, the water tank nearby was visible to me which had stroke an immediate idea on seeing two huge dusty useless empty containers near my feet. When I had lifted them, they were like bathing mugs to my huge hands and then directly drenched them in the tank over there, took it back and poured those hundred liters of water over the burning tower once. Fire over the tower had slowly limited to smoke. And, I did the same thing for another four to five times and the whole tower was extremely wet which had completely extinguished the dreadful fire at my workplace. Everyone inside were safe with not even a small hurt then leaving just a little physical damage to the infrastructure. Over flowed water filled the entire premise wet. It was the time that people over there started realizing my super heroic contribution in saving their lives. Yes, all those people inside the tower of criticality were landed safely and everyone started applauding me as if I was their deity down to earth who saved them!!! Unexpectedly, they started shouting and lauding as "Jai Hanuman !! Jai Hanuman !!" towards me. I was clueless that how did they find this out that these happenings were Hanumanji's measures ??!! Then only I had noticed a thick long structure was following me wherever I move and it was Aanji fame Tail behind me and another notification confirmed my contemplation!!Yep. My cheeks were swollen red and skin was completely hairy. People easily found out from the simulations !! 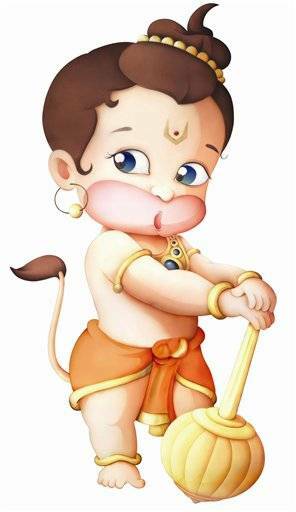 I had realized that the avatar wasn't Hulk but Bajrang bali's Vishwaroop !! But, I wasn't having "Gatha" since it was purposeless for my activity done. Instantly, a smoke bomb had exploded beneath me and I came back to normal physique all of a sudden since the task of my second mantra was done. Fortuitously, nobody over there were clever enough to recognize me who did the recent super-heroic safety precaution to them. So, I simply got into the crowd of amazement over there as if myself too couldn't able to guess what had happened there. It was almost 12.15 p.m. After chanting hanumanji's name with the crowd for a while, everyone started moving to their workplaces and calling their close circle to inform what had happened here. Everyone were calling them back and even I was on this callers loop. All my *friends, *family people started calling me to ask about the exclamations happened here. (Who never even tried calling me before for a very long span). Told the same story to everyone as the people nearby passed on to their people. Again, the news spread all over media before the smoke got vanished and R&D had started at my workplace on finding out the solution for traditional "How?" query. "Hanuman In the City", "Chennai corporate people saved by Vaanaraveer", "BajrangBali Is Back", bla bla bla were becoming their breaking news on many channels. Anyways, my job had been done and I never bothered about the rest happening over there on my behalf. An exciting day at my workplace had come to an end. Bored of these people's exaggerations, amazes and surprises which never seemed to end even in the late evening. It was 7.15 p.m. So after done with my work of the day, boarded in bus back to home and got down in my stop. As usual, huge traffic on road and was waiting to cross it on watching out the signal when it would turn green to pedestrians. Need to cross it to get into a lane where my home was located. It was 8.15 p.m. Between, a weird man came into picture ! !